What do specific smells from your AC mean? If you live in Florida, you probably use an air conditioning system almost all the time. In case you come back in your home only to find out that there is an unpleasant smell in it you will certainly be annoyed and unpleasantly surprised. If this odor comes from the AC unit, you should definitely spend some time to recognize the type of smell and where does this odor come from. The following is a list of typical smells that come from AC units due to certain technical issues. In case you notice that the AC unit smells like rotten eggs, it is very likely that you are facing a difficult problem. This is a type of smell that comes as a result of a broken sewage line. This is where methane gases pass and in case it is not working properly, they will leak directly in the AC unit and spread the odor around your home. It is the best idea to locate the place where your air duct is damaged / broken. However, if you want to fix this problem for good, call some air conditioning repair professionals. We all know how burning smell looks like. 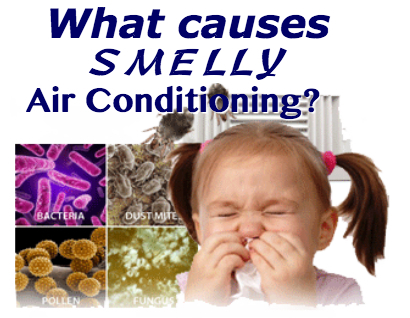 In case this smell comes from the air conditioning system, you have an electrical issue. This specific smell comes from the overheated blower motor or from a certain type of mechanical failure. The reason is simple – accumulation of heat from the plastic insulation located over the wires. They start to melt and hence the burning odor. In addition, if objects made of rubber, plastic or similar materials get stuck in the ductwork they can cause this smell too. If you walk into your home and notice a smell like the one that comes from decomposed animals in the AC unit, then there is damage in the air conditioning ducts right under your home. It is not unusual for animals in Florida to look for a place to stay during better weather and they usually go in the vents where they are trapped and die. This is not something that is happening frequently, but it happens. In case your air conditioning system produces damp smell, it is very likely that mold is accumulating inside the air conditioner. Professional AC maintenance technicians often deal with this type of situation. You can remove this smell by cleaning the AC unit. Change the filter and clean the inner side of the AC, the front grille, perform AC coil cleaning and wipe the drain line. Of course, don’t forget to turn off the AC unit completely when performing this task. The HVAC system has a cooling and heating part and the heating part is usually working on natural gas. So, in case you notice gas odor, open all the doors and windows in your home and leave your home. Call the gas company and ask for their help. Share the post "What do specific smells from your AC mean?" If you live in Florida, you probably use an air conditioning system almost all the time. In case you come back in your home only to find out that there is an unpleasant smell in it you will certainly be annoyed and unpleasantly surprised. Posted in Air Conditioning FAQ's, Blog Articles and tagged ac, ac bad smell, air conditioner bad smell, air conditioning bad smell.